Take a visual tour of all the great feature included in the All Orders solution! Welcome to the All Orders product tour. Click on a tab below for a brief overview for the associated module of the solution. Our user interface has been designed with visual cues everywhere, helping users find what they are looking for. Bright and colorful icons have been assigned to every function in the system and are easily associated with their purpose. Tabbed screens means easy toggling without constantly maximizing and minimizing windows. You can even change the colors, toolbar buttons, tab styles and more on a user by user basis. The Home Dashboard is a special launch screen that serves as a handy one-stop collection of all the often-accessed lists and forms. 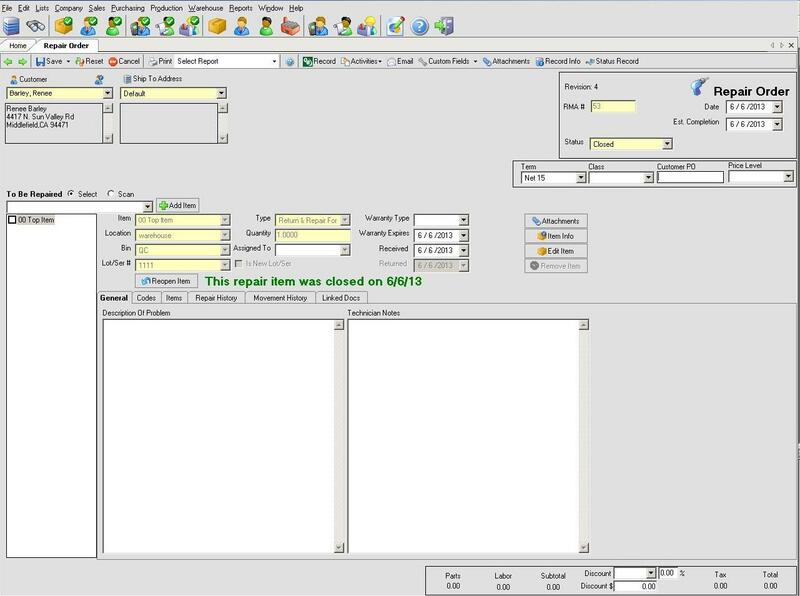 One click access to popular sales, purchasing, production and warehouse function plus quick reports make this a go to screen for many users. 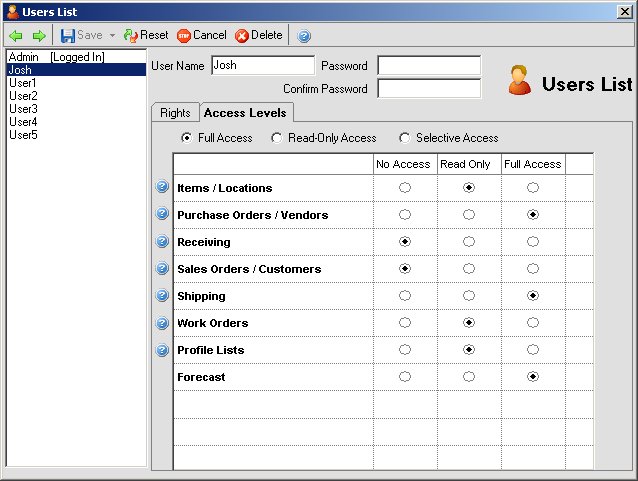 All Orders has powerful lists for every entity and document in the system allowing anything to be located with ease. Every list includes rich features such as searching, advanced filtering (with wild-card and compounding support), sorting, custom columns views, custom colors and more. You can even print and process transactions in batch from the lists! Our customer information screen provides a complete history of every transaction for each customer. 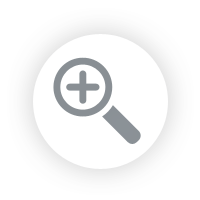 Combined with searching and filtering, staff can easily find quotes, orders, shipments and return and open them for viewing or editing with a single click. Included on this screen are the customer contact details, internal notes on the customer and an A/R Aging summary for their account. Shortcut buttons are available for quick reordering of products, duplicating quotes and orders, and opening new transactions for the customer. All Orders provides documents to cover the entire Sales Cycle. Quotes can be issued to customers and then easily be converted into actual Sales Orders. Orders can then be filled with shipping documents which prompt the pick, pack and ship process, culminating in an invoice being generated in Quickbooks. RMAs and Customer Returns can be generated as well to complete the Sales Cycle. For large volume shipping our Batch Shipper will auto allocate available inventory to customer orders and create shipping documents on the fly. Select which orders get inventory first, date ranges to filter orders to ship, and specify customers or locations for shipping if necessary. 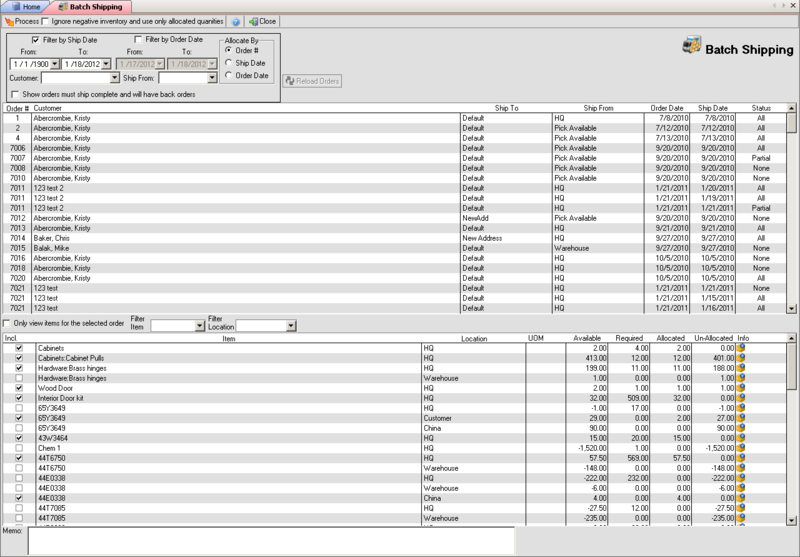 You can even manually override allocated inventory to pick and choose which orders get shipped. Click Process to generate shipping documents, ready for printing, picking and packing. Need to take payments on customer orders? All Order has it covered! Assign special terms to customers that require payments to be taking when orders are placed or upon shipping. Apply payment methods such as checks, wires, or credit cards. Enter all relevant payment information and All Orders will make sure the payments are recorded in Quickbooks and applied to all relevant documents. You can even process credit cards through your gateway and merchant account! Attach a USB card reader and use the built in swipe function for walk in sales. Now you can handle complex kits and configurable assemblies with ease. Build kits comprised of required items, upgradeable items, and optional items. When sold a unique wizard will guide the user through selecting all the options and pricing available for each kit per the customers request. Need the flexibility of a kit with the building functionality of an assembly? Configurable Assemblies allow you to setup specific components as being upgradeable or optional, just like in a kit! They can then be configured when the order is placed and the proper components will be used when production is started, allowing you to offer truly customizable, manufactured products to your customers! Our advanced price levels include company wide discounts, customer specific discount, customer specific price catalogs, customer specific discount by item category, markups, item specific volume discounts, kit discounts, special pricing per currency and more. Setup an unlimited number of price levels for different times of year or customer types. 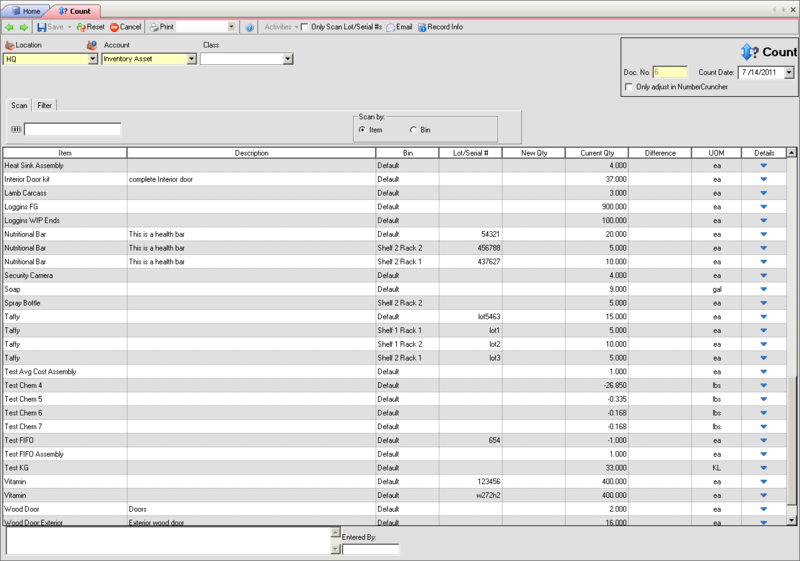 Import pricing catalogs directly from Excel. 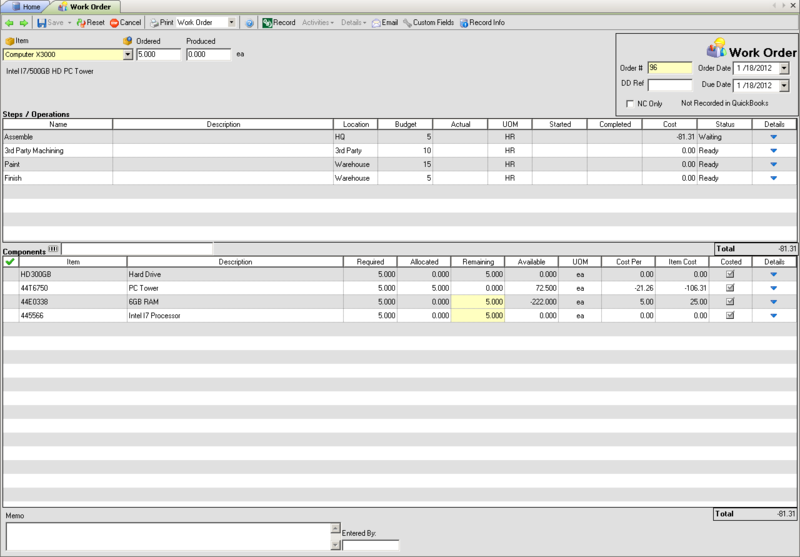 Give customers special pricing on orders by overriding assigned price levels with a new one on an order by order basis. 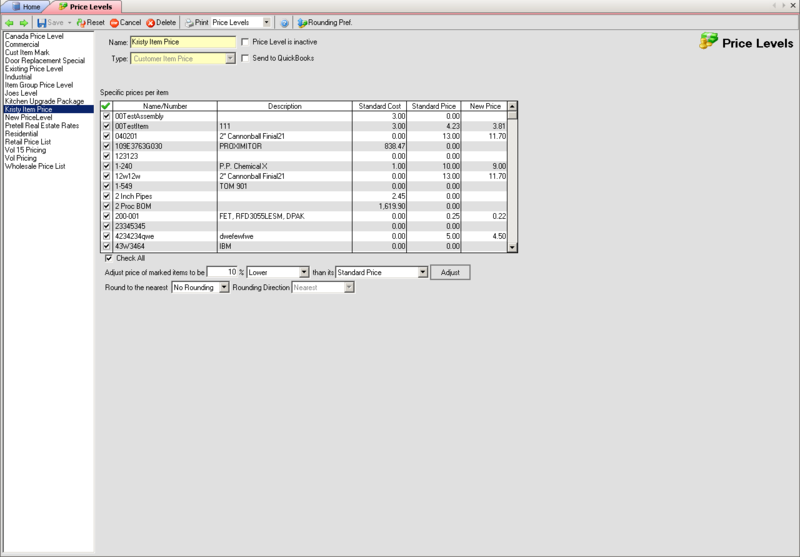 Be sure to set up rounding preferences so the prices always come out looking just the way you want. Finally put your purchasing cycle on the fast track with our specialized purchasing tools. 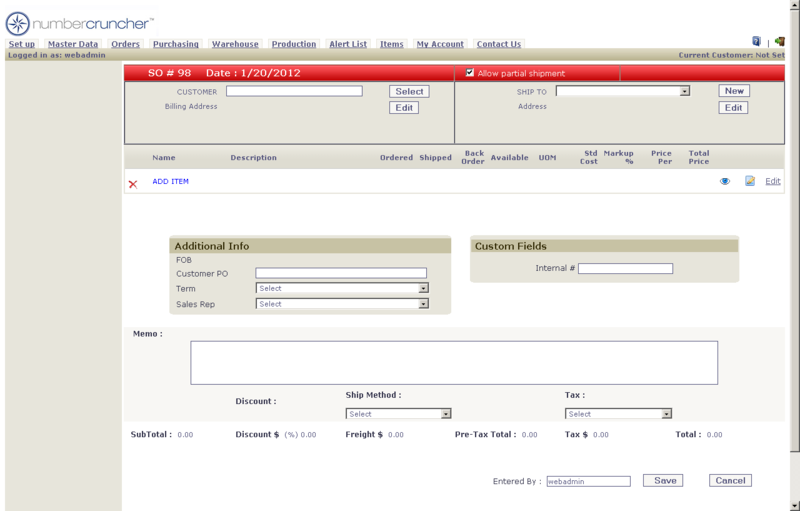 Create Purchase Orders and print/email them with a single click. Receive them into stock with our Receiving Document, which fully supports bracodes, bins and lot and serial numbers. Send them to Quickbooks when complete to create bill or item receipts. 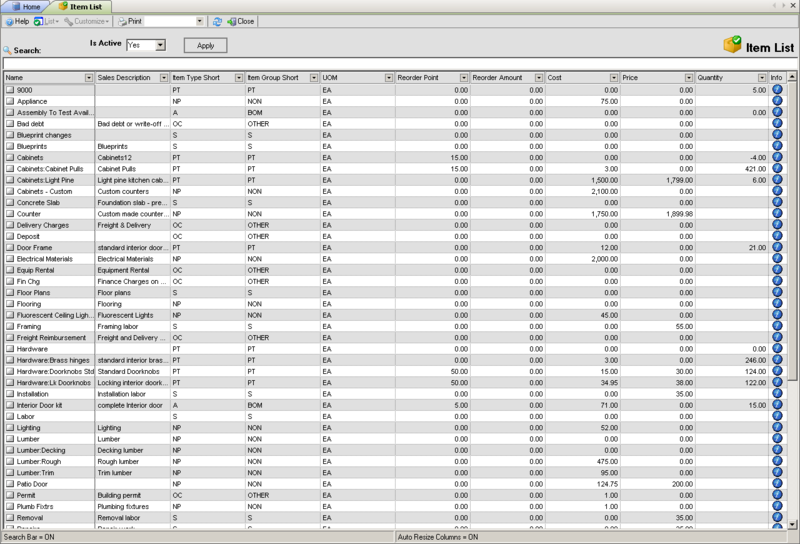 Run receiving log report to track and manage your receiving. Make Vendor Returns and send them to Quickbooks for Vendor Credits. Enjoy end to end purchasing capabilities with All Orders purchasing module. 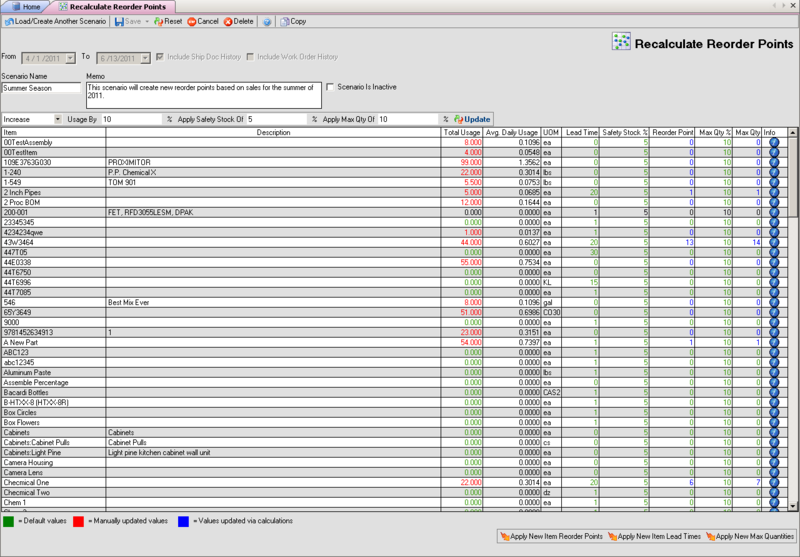 Using the Preferred Vendors list, multiple vendors can be setup for each item. Specify the vendor along with their part number, UPC, cost, lead time and more. Each item can have a default vendor as well. Tired of manually creating Purchase Orders to restock the shelf or fill customer orders? The Reorder Analysis screen will create Purchase Orders in batch based on items falling below reorder points or orders needing inventory. If you have multiple sources for your items, pick and choose who you want to buy from on the fly. Update costs if you get special pricing and quantities if you need just a few extra. Click Create Orders and like magic all the expected Purchase Orders are created and ready to be sent out. 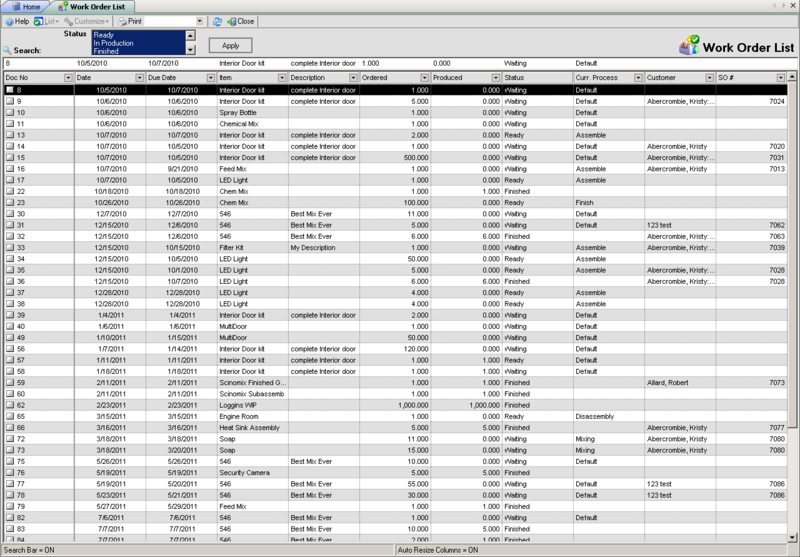 Reordering for stock based on how much you expect to need can be difficult and messy when using Excel. 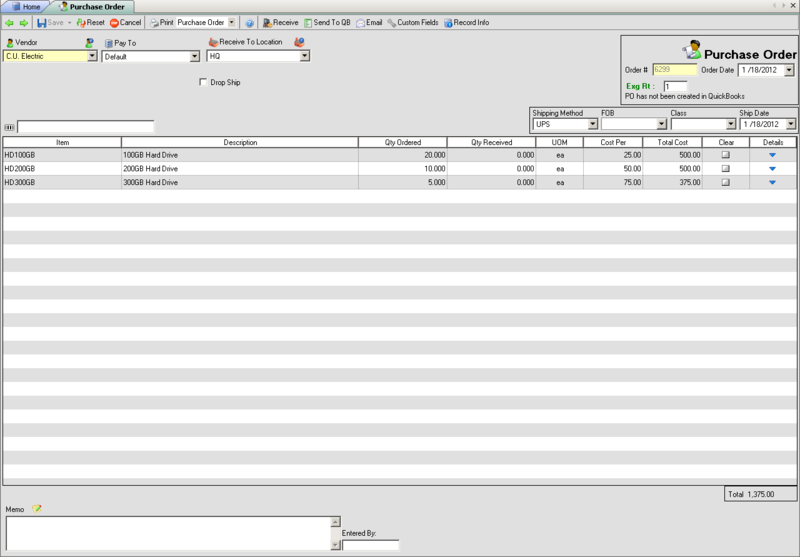 With the Reorder Point Recalculator just put in the date range for the history you want to use and go. Create new reorder points for upcoming seasons based on the previous year's season. Include safety stock amounts just to be sure you will not run out, update to actual seasonal lead times, and change maximum quantities to be carried. Save all the work and bring it up late to tweak and modify to your hearts content! 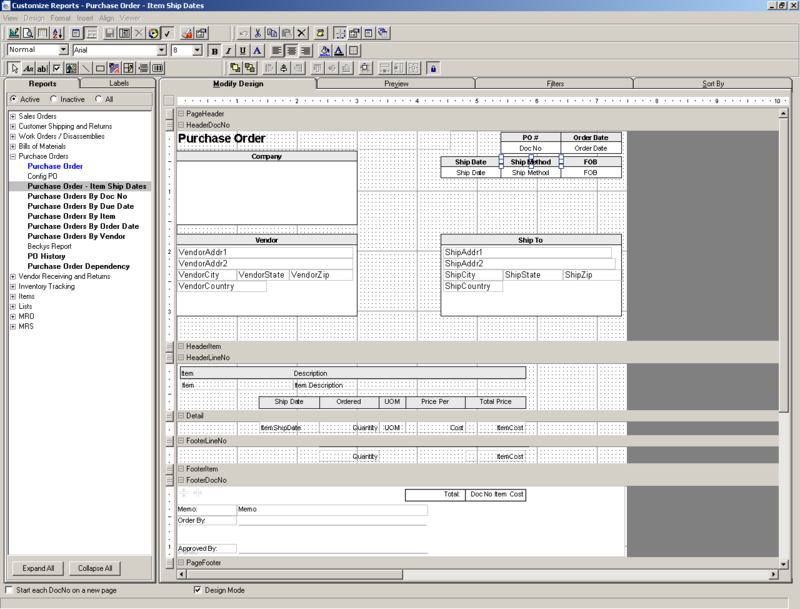 Dealing with complex Bills of Materials (BoM) is a breeze with All Orders. Setup routing using the Steps to specify the different stages of production that need to be tracked. Assign components that will be used at each stage of the production process. Nest subassmeblies to create indented BoMs with unlimited levels of detail. 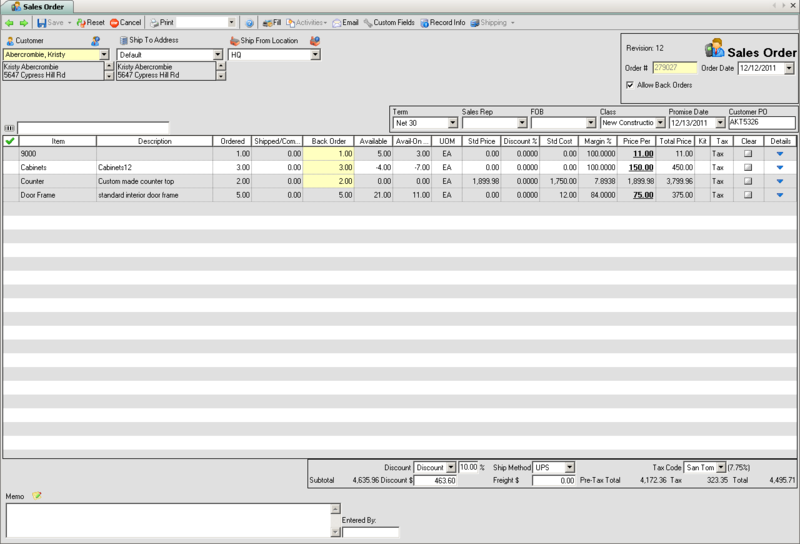 View cost breakdowns, margins and markups. Assign components to be one time use, such as machine prep. Integrations with SolidWorks allows for importing of drawings. Use Phantom BoMs to configure complex assemblies to be broken down into easy to manage subassemblies which can be flattened during production. The Work Order and Disassembly use the BoMs that have been defined for high level production management. Build complex assemblies with the ability to modify components to be consumed on the fly for each finished assembly. 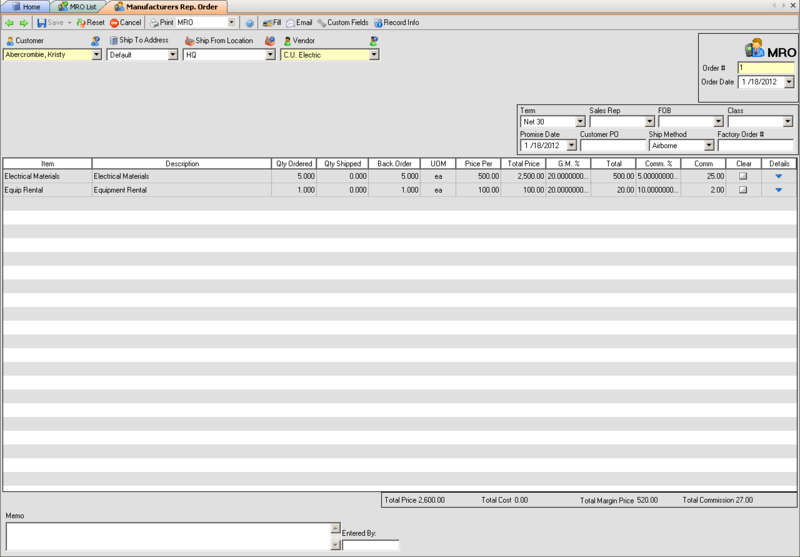 Allocate only what you need to begin production and split Work Orders to keep production moving. Drill down Work Orders to build infinte levels of subassemblies. One click purchasing tools can generate Purchase Orders for any raw materials that need to be ordered. Specify quantities produced and include wasted raw materials to actually sink the correct costs into the finished assembly. The Disassembly can be used to if an assembly is returned or needs to be broken down for its components to be put back into stock. Our Work Order List offer a top down look at the current state of production. See the status of each Work Order along with the current stage it is at, which customer/orders is waiting on it, and track master Work Orders and the production of its subassemblies. 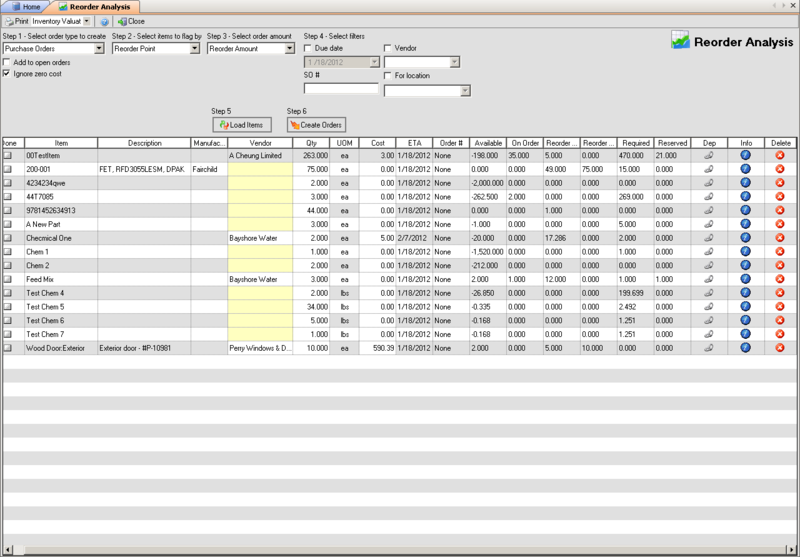 Batch allocate, print, and finish Work Orders for maximum efficieny. Our new RMA and Repair Order screen allow you to track and link together multiple activities and transactions in a single view. These activities include documenting the problem, issuing the RMA or Repair Quote, checking the warranty, reviewing repair history, receiving the product from the customer, assigning a technician to evaluate and work on the problem, issuing a vendor return or replacement sales order and then finally returning the product and invoicing. Track an unlimited number of locations and bins (any logical or physical area within the location). Ship, receive, produce and manage inventory in each location, all from one system. 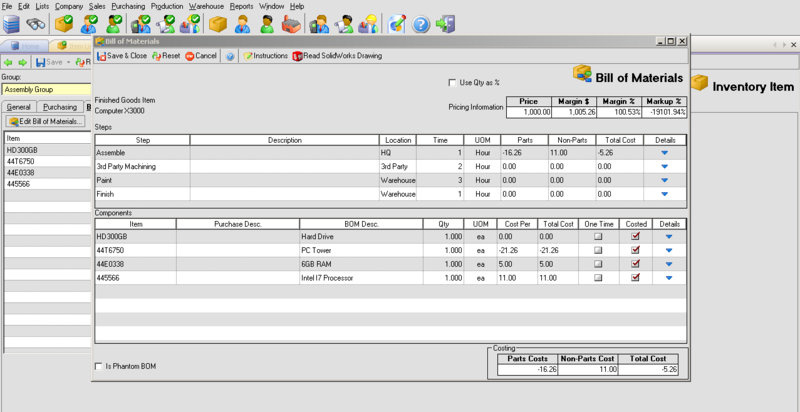 Get a complete look at your entire inventory by using the All Orders inventory tracking reports. Move inventory between locations to satisfy location based demand. With the Item Information screen you will never need to hunt through reports for an item's history again. Available from every screen in the system where items are used, an entire snapshot of the item is available to view and interact with. See all the locations that stock is located in and the statuses of that stock. View related lot and serials numbers, preffered vendors, open Sales and Purchase Orders and even a list of every transaction the item has ever been on. Search, filter and scroll the lists to find what you need and with a single click bring up any transaction. Many industrues, such as electronic, food and beverage, and pharmacutical, require the tracking of lot and serial numbers. All Orders includes full support for creating, managing and tracking lot and serial numbers. Once an item has been specified to track lot and serial numbers, every posting transaction will include an entry screen where new lot numbers can be put into stock and existing ones taken out. Easily generate new numbers in batch, print label with or without barcodes, scan them, enter and track expiration dates, import and export them and more! 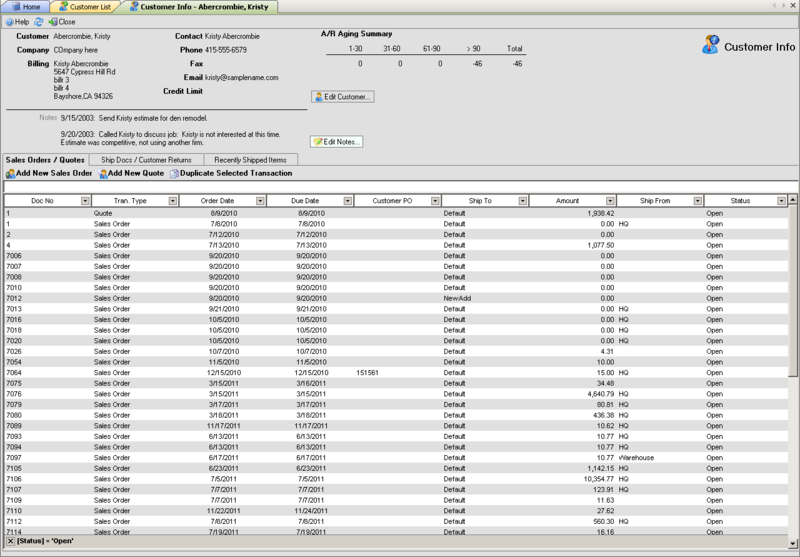 Still thinking about using Quickbooks to track lot and serial numbers? Be sure to read our Comparison of Lot and Serial Number Tracking between All Orders and QuickBooks. 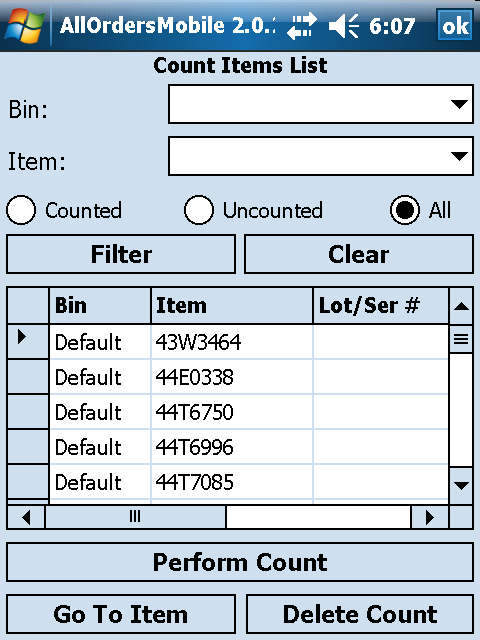 Count inventory with ease using the cycle counting screen. Simple bar code scanning means faster counting and fewer data entry errors. Print multiple count worksheets for additional staff to collaborate during the counting process. One location overstocked? Another one out of stock? Move inventory from one location to another with the Location Transfer screen. Fully supports bins, lot and serial numbers, bar codes, printing shipping labels and sinking additional shipping costs in the value of your inventory. Besides packaging 100+ forms and reports, All Orders includes a full featured report designer. Create unlimited custom forms and add personal touches such as your logo, fonts and colors. Change the default system forms to be your custom forms. 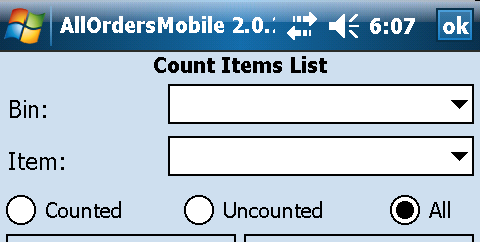 Add and remove fields from forms and report so all you see is what you want. Add custom fields for extra flexibility. Print labels and barcodes for any report or form. Advanced users can create calculated fields and formulas and even create new reports from scratch if familiar with SQL Server. The All Orders Bound Book application allows companies buying and selling firearms to maintain a bound book database in accordance with FTA regulations. 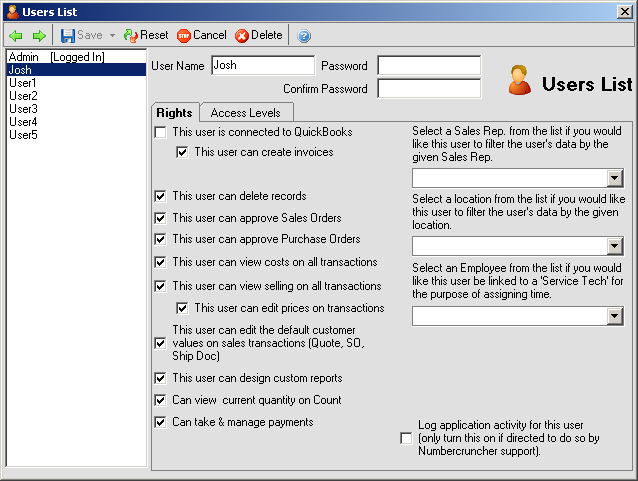 As transactions are entered into the All Orders system the separate bound book database can be synchronized and auto populated based on the inventory in and out. With licensing based on concurrent users, your user list can be as large as you like. 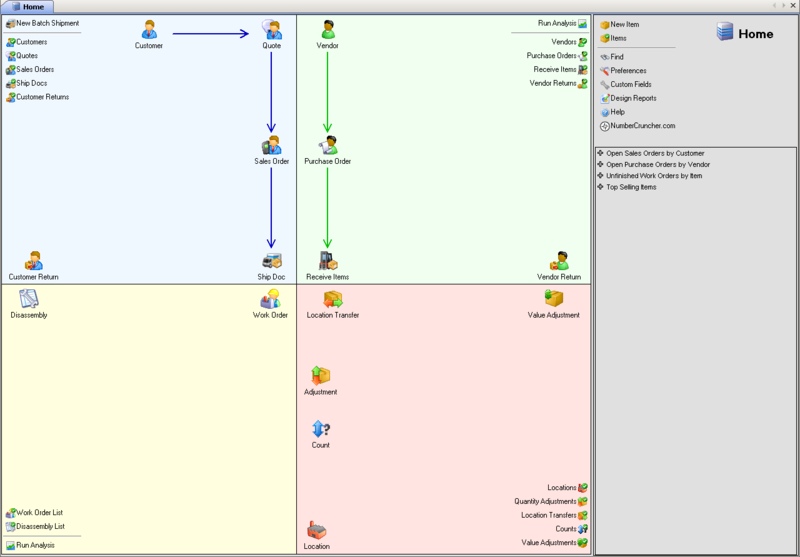 Each user can have role based security setup so they only have access to what they need. Additional right can be granted or denied for fine grained control. Store an item with one measure, sell it and buy it with another? All Order supports powerful units of measure and conversion rates. Store, purchase, produce and sell all with unique, predefined measurements. You can also change measures and conversion rates on the fly when buying or selling for unique circumstances. If you have spent hours generate item numbers for multiple variations of a single item, such as size and color combinations for clothing, the Style Matrix Generator will help get the job done in a matter of minutes. 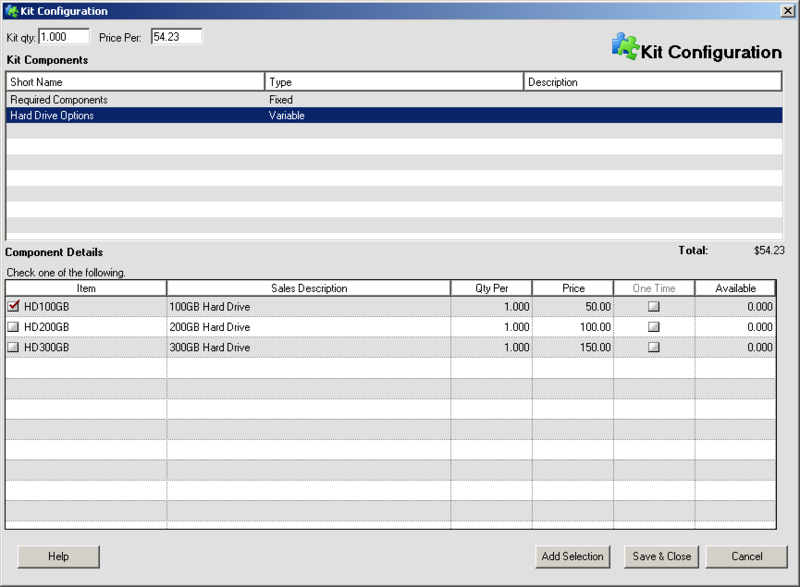 Specify which attribute the items will have and with a single click generate all of the item variations for the item. All Orders includes the ability to create Manufacturer Rep Order and Shipments. 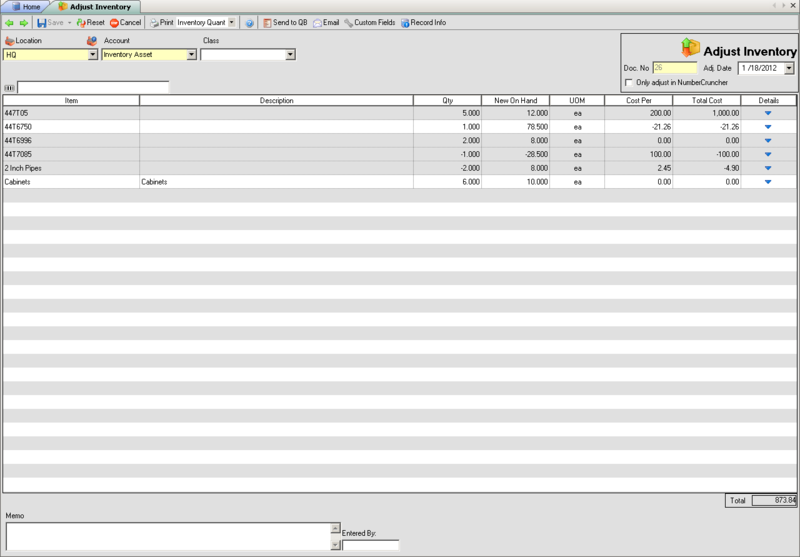 Create orders on behalf of a manufacturer or vendor, where you are acting as a middle man to the customer. The manufacturer collects the sale proceeds from the customer and your commissions are calculated and recorded in QuickBooks. We offer complimentary mobile and web based add ons for enhancing the All Orders solution. For more information visit the All Orders Mobile and All Orders Web pages. 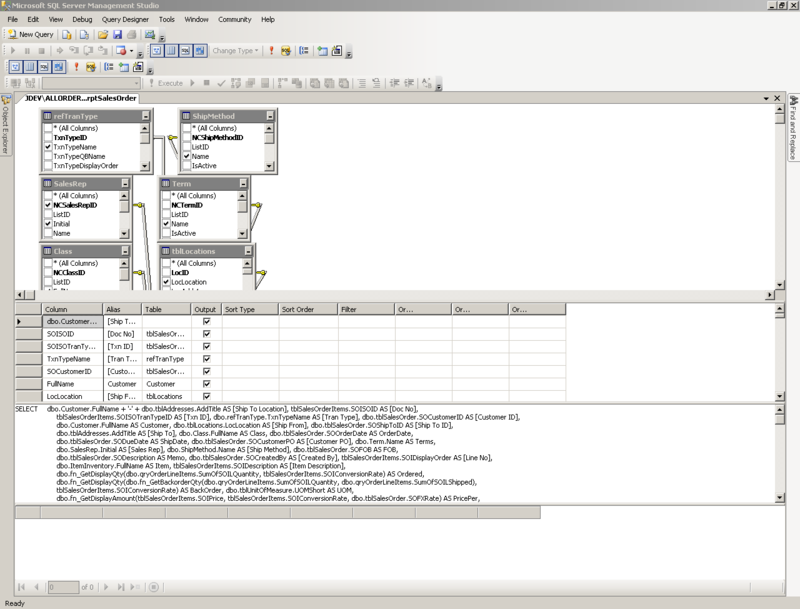 Our back end is SQL Server and the database is compatible with any version of SQL Server 2005/2008 including Express. 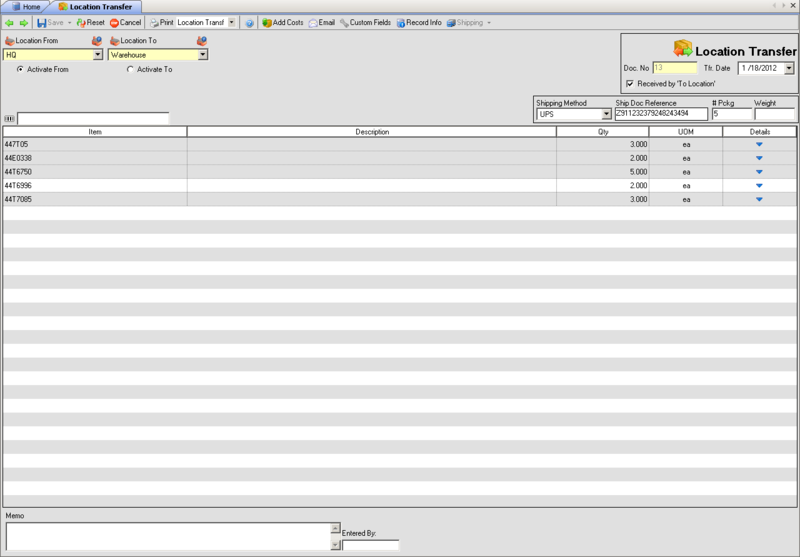 Already have an instance up and running you would like to attach the database to? No problem! Our database is open and can be accessed and mined by other applications or reporting services.